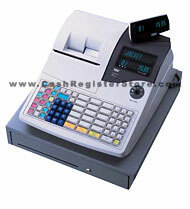 TEC MA-1535 Electronic Cash Registers at Cash Register Store. PRODUCT NO LONGER CARRIED. SUPPLIES STILL AVAILABLE! The TEC family of cash registers welcomes the newest member, the TEC MA-1535 electronic cash register. Finally a lower cost TEC model with many high end features to compete with other leading brands. The MA-1535 is our lowest cost cash register with 3 RS232 ports. Interface with perhiperals including a PC, remote printer, scanner, scale etc. The TEC MA-1535 excels in features! With an optional 12Mbit memory expansion the cash register can handle up to 24,000 plu's. Standard features on the MA-1535 include a 10 character alphanumeric operator display, thermal receipt and journal printers with 2¼ inch wide paper. Additionally these printers print up to 24 characters per line. TEC has a reputation for manufacturing high quality durable machines to withstand years of service. For a high volumne retail business this machine comes as a highly recommended cash register. Quiet, 10 lines per sec.